Fam and Ihrie are willing to do almost anything to make a buck. So when these debt-driven damsels discover the potential profits to be hand in recovering a particularly dangerous mystical object, it means mortal peril for an entire civilization. There's no guarantee that they'll live long enough to squander the fabulous wealth they've been promised, and danger lurks around every turn as they cross dark seas in pursuit of legendary evil. Haunted by an unspeakable curse, plagued by doomsday prophecies, plotted against by untrustworthy traveling companions and looked in desperate race to gain the Ultimate Power, Fam and Ihrie are the Ruin Explorers! Hikyou Tanken Fam & Ihrlie, or "Ruin Explorers", is a lot like something you'd find in your typical "Dragon Quest" game (starring Muttley * ). We have our fantasy setting with a similar medieval-themed world. We have our growing party of characters, with personalities, who interact while continuing their adventure. We have that adventure in place of conquering an evil. Heck, we've even got the trademark boat segment with some of the things you might expect. The other thing we have, more in tune to the king of "Dragon Quest" games, being 8, is a masterful soundtrack of nearly the same caliber (if you haven't at least tried Dragon Quest 8, get it now). To start, let's cover the superficial aspects. Ruin Explorers is not from the twenty-first century, so there isn't the modern art style to accompany this. That shouldn't be objectively placed with a positive or a negative, but the art style here is a bit different from stuff made today. The character's faces look very angular, like a bit more of an extreme version of "Evangelion". It started off as strange as I haven't seen that particular style before, but I quickly not only got used to it, but began to like it for what it was. The art style isn't too hard to like either when considering the fantastic animation at play. For the art style present, the proportion-work is perfect as I didn't notice one moment where it failed to stay consistent. The animation itself is also very smooth and is basically feature-film quality. That isn't the end of paying respects to the animation, however, as there are other elements that are done tremendously well. Firstly, Ruin Explorers has to be one of the most vibrant, fantasy anime in terms of the color scheme and the richness of said color. For being sub-HD, the footage contains plenty fo grain that makes the colors really stand out. That aids in making the entire package feel powerful in each visual aspect, and don't think that doesn't include direction. To start, the art direction is about what it should be, but isn't too unique. The art director aids in crafting a solid fantasy environment, making everything look great in terms of what you would expect, but there aren't too many unique traits to it. While the art director doesn't hold anything back, the director of what literally goes on, in what way, is the person whose earned most of the credit. The director has taken four nearly 20-minute episodes and was nearly able to fit the sensation of growth and excitement that one could find in an entire 12-episode series. Everything is given just the right amount of time, and there isn't any worrying over the the amount remaining, as the director isn't afraid to add in some moderately lengthy moments of pure character interaction - leading to considerable development. He's also quite creative in how he chooses to present scenes, and although the story isn't too unique or complex, there were several moments I felt surprised to how events turned or how characters would act the next time we see them. Remember Takeshi Mori because either he has only done a great job here, or he is one great director (haven't yet seen his other works but he has my attention). I have seen a bit of "Gunsmith Cats", which he directed and was great as-well, and "Skull Man" is also noteworthy from what I've heard. Paying attention to individuals doesn't end with the art, however, but only becomes more evident when turning to the sound of Ruin Explorers. Firstly, the fact I can put the composer near that of the soundtrack of "Dragon Quest 8" is a huge accomplishment. The soundtrack is fully orchestrated, and I'll admit I can be a huge sucker for orchestrations. However, these were done exceptionally well and could've easily fit into some live-action movie of the time and likely made it at least known by having the soundtrack included. Don't expect to find the soundtrack outside of the OVA though, as only some of the vocals were released. The man behind it is Masamichi Amano, also having composed for "Bio Hunter" (which was quite good) and numerous other smaller series I haven't seen yet. Give him attention, as well as the sound director. For just having watched a bit of the show "Real Drive" and it's horrible sound directing with non-stop compositions, what Yota Tsuruoka had for me here was a blessing. He really knows when are the right moments for either effective use of tracks that really only have one use, or using tracks in more general situations to make them more intriguing. He's done plenty of famous shows, including everything Clannad, and I know I loved Clannad's sound directing at the time. Again, pay your respects. So, the story of Ruin Explorers is basically your typical "Dragon Quest" story-line. However, in a way we don't follow the hero as much here, making for a more interesting look at things. How it develops is quite interesting in the moderately unpredictable nature, so I'll leave that at that. We do have a quest of retrieving a set list of items, however, to find and collect. The beginning of every episode will also name itself as a "Turn", like "Turn 1" or "Turn 2". The saturated colors also reminisce that of "Dragon Quest". So with the continual comparisons, the setting of these OVA can likely be understood. The story is similar to that of an RPG, and for that reason it isn't anything too impactful all on its own. However, there are a few interesting imaginative elements to the world, and it still isn't a story where the ending can be seen from the first episode. The storytelling is dynamic, and that is its strength. That strength also drips down into a bit of what makes the characters of Ruin Explorers so interesting. We have our growing list of party members, but who ends up staying and being discovered is quite uncertain as things go on. There is a limited amount of time to present everything, and the OVA realizes that it doesn't have to put the focus on a deep plot when having such a time-limit, but on the characters. As the story is the backpack that the characters choose to change at their will, the characters feel free of any contrived use and all feel like genuine individuals. Each are given a differing personality, some slightly cliche in relating to archetypes, but most are forgivable when relating those archetypes to what is expected in a fantasy setting. The characters all don't exactly develop, but they all interact in reasonable ways that give them all a bit of outward confidence. Each of these characters becomes familiar, maybe not by name, but by being cared about by the viewer. They more serve as fundamental components to the group than a named character. That isn't the same to the two, main characters, however. We have a female warrior, "Ihrlie", as arguably the true main character who doesn't feel a need for romance and is an example of what a character like Asuna could have been. It's a character you can respect for being independent and, again, confident. She is also given a bit of a back-story which doesn't hold back the plot, but is told in a manner that flows nicely with it. That could be said even more to her assistant, "Fam". Fam is a character who doesn't carry as much of a back-story, but interacts heavily with specific characters in the story. She also develops as an individual by pushing for change and internally becoming stronger. She doesn't have that prior history, again, but is almost used as a catalyst to moving the plot forward. She is the doer in that her actions lead unexpected changes to many situations, slowly trying to make those changes more controlled. Ihrlie doesn't develop as much as Fam in learning herself, but in a way the charm of Ihrlie is that she already knows herself. 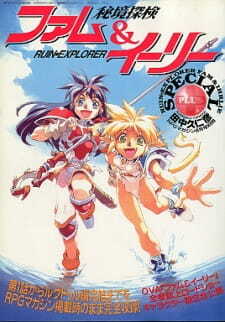 Ruin Explorers is the typical, RPG plot done right when translated to film. It understands that the literal goal of an RPG isn't the bulk of interest, but the adventure and the characters that are met, coming along with a nip of unpredictability. The art style isn't something that would be done now, but isn't hard to get used to thanks to the excelling budget. The music is fantastic and the direction for it as-well. There is also an opening and ending theme, but the ending theme takes the cake with being a tune that grows on you by the end. The characters are done to their best for the time given, and that isn't a low degree by any stretch of the imagination. Not many times do I finish an OVA and feel a bit of the same withdrawal that one might feel when finishing "Fullmetal Alchemist". I want to see more of these characters, but that's not going to happen. Possibly to my luck, however, a series called "Slayers" was popular enough in the past to get a lengthy series. I've heard numerous comparisons of the two's styles, so that may be the next best place to go for more. Ruin Explorers is an unexpected hit in my book, and is recommended to all those who can tolerate well-animated, old art. It may be convincing to you to know that there's a ganguro girl present (the rare creatures). Also, it's recommended to stick to the english sub with this one, overall better performances. Ruin Explorers are just like the name states: Something you look at in hopes of finding a treasure but you need to first search it in order to see whether you´ll find a treasure or just piles dirt. So what does this 4 episode OVA hide inside ? The story takes us to a fantasy world where people called Ruin Explorers do their work in order to either stay alive by finding at least something valuable or they search for mythical treasures of immense power. In this world Ihrie and Fam are on a search for the “Ultimate Power” in order to fulfil their wishes. Along the way they meet a few other characters with the same idea on mind as them, a prince who wishes to avenge himself for the demise of his kingdom and you can pretty much guess how it all turns out. By now you may already think that there isn´t really much of originality in the story or the settings but the way the story is told and how it all unfolds is a rather refreshing return to the good old days when fantasy anime were still all about magic and monsters rather than fanservice and commerciality. But I would also lie if I said that this show is perfect. It has it´s minor setbacks and not all things are cleared or explained in the end but the ending is nice and satisfactory never the less. The number of characters in this show is rather low but who´d need more in a 4 episode OVA, right ? The main duo Ihrie and Fam are done nicely, each having their own distinctive personality which only contributes to the old days of fantasy anime. Ihrie being the headstrong tomboy with mild temper and swords flying around while Fam is the gentle and innocent type that would never hurt a fly and is the main source of “accidents” which put a smile on your face. The rest of the supporting characters are pretty much as you´d expect them to be. You have the rivals, the greedy merchant, the arch-villain and a handsome prince looking for revenge. The downside (more or less) is that none of the characters is actually looked at deeply. Meaning that aside from a glimpse of Ihries´ and the princes´ background there isn´t almost any character development. The art is the same as the entire anime – old school. The character models, the backgrounds, the depth of the colours or the details. Everything is as it should be considering the age of this anime. It all smells of nostalgia and the good old days of anime like Slayers or Gokudou-kun Manyuuki. Of course, it´s no eye-candy like today's shows but it has it´s own ring to it and if you aren´t an addict to the modern looks of anime this will hardy be a distraction or a negative for you. The OP and the ED are nice but you´ll probably skip them after the first time hearing them. They too are in the tone of the old ways but that doesn´t mean they´re bad, just that they aren´t that good either, but how can you judge until you hear it for yourself, no ? It was rather nice to once again see a fantasy anime that actually is a fantasy anime. Don´t get me wrong, I have nothing against modern fantasy anime but it´s just that the old ones seem to be a bit more true to the genre than the modern ones. All in all, the show was entertaining despite how short it was so I don´t see a reason why not give it a try. (5)- Anywhere, anytime, as many times as you like! (3)-Once for regular viewer, 2 (or even 3) times for a fan. (2)- Seeing once is more than enough. Stereotypical classic JRPG nonsense. Heroes are on a quest to retrieve a set of magical items that a powerful villain is searching for as well. Beyond that are plot points that become disposed of quickly and by the end of the 2 hour run-time you're comfortable not knowing the ending to a few sub-plots. The narrative doesn't take itself very seriously with a plethora of jokes hackneyed throughout, and at the points it becomes somewhat serious it's still rather basic and doesn't try anything fancy. Straight forward, but not schlock. Thank goodness. All of this comes together to become a check-list of classic fantasy adventure tropes that get checked off one by one. That's alright, since I wasn't really asking for much more after 2 episodes in. It satisfied me enough and I found it pretty enjoyable, even if one episode ends with the characters ship-wrecked and the next episode starts with them in the middle of a desert. I really enjoy the 90's rough sketch look of this anime but with that comes some other lazy animation decisions. For instance, the action is non-existent. It became very evident that after the first episode I wouldn't be witnessing a shred of combat. I believe there are roughly 3 sequences of actual hack-and-slash while the rest are the heroes surrounding by creatures (a very limited bestiary, by the way) and then the next scene the creatures are defeated. Again, not to bothersome. None of it really questioned my intelligence or made me feel like I missed out on anything. Rather, it's like a check-list similar to the tropes that needed to be knocked off in the story. The setting is largely barren and uninspired. Deserts are easy to animated. Oceans are easy to animate. Destroyed locations are easy to animate because it's rubble. I would have appreciated some more, I don't know, 'definition' to the setting, but that would require another episode to elaborate on some certain aspects, such as "this swamp has X history and Y lore and so we must be careful." And then it turns into filler. More of a story critique, but how the art is handled can affect the story. The Soundtrack was actually pretty good, but after 4 episodes it's repeat songs that lose their effect. Unfortunate, as the directive approach towards the music was pretty fantastical and had adventure at it's core. Very cool, but wears thin quick. Sound effects were forgettable and all stock stuff everyone has heard before. One creature repeated the same battle-cry over and over and it became less so intimidating and more-so irritating. I couldn't wait for it to die. Sufficient. Ihrie was quite interesting but the narrative shifts its leads haflway in and she gets put on the backburner. A shame, but nothing could be done. The narrative introduces Lyle in the second episode who becomes the backbone of the stories progression, so it couldn't be helped that the original 2 characters get knocked back. Everyone is stock. There's nothing all that interesting here. It's just basic but in the end gets the job done. Content. It was neat. Had the run time been more than 4 episodes I can guarantee that my interest would have waned. Use of tapestry and voice narration made for a delightful introduction. As for tapestry not only illustrated time era of story but added royal mention. Both of which vital to story's plot. When one watches a story they expect a criminal and a hero. Little do they know both of which were heroes in their own way. Sadly, one grew stronger than the other. Although, in the end it all worked out. Would have been nice to see what would have happened if story matched up to 'alleged ending' but this ending was just as good. For while it did lack in comic spin as original could have brought instead demonstrated a more selfish cause and slight emotional impact. No complaints. Although, legs of a character or two appeared to be stick like. Not bad just a little abnormal to the eyes. Perhaps it had something to do with the light and setting it was in. After all we all have our good sides and our bad. Ask your neighborhood professional camera person if you don't believe me. While not fully developed in all characters having an in-depth view of their past, there was a backstory on the villain aside from what was earned by his powers. Also, one might find one of the main male characters as well as female to be quite enticing. Not just from artwork construction but how they carried themselves.